I'm waiting for the orchestra to stop playing, for the curtain to fall. Amiable but very slight feature from Ira Sachs. Ben (John Lithgow) and George (Alfred Molina) marry after nearly four decades together, leading to repercussions whereby George loses his job and they’re forced to sell their New York apartment. 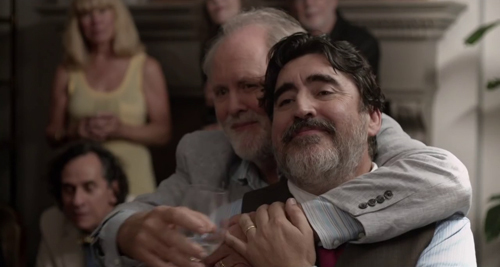 Moving in separately with friends and relatives means the main appeal of the film – Lithgow and Molina sharing screen time – is in short supply. 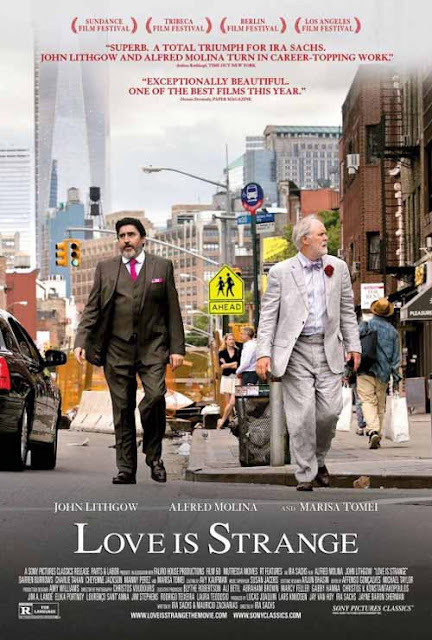 As for the title, Love is Strange suggests something considerably quirkier than we get. Indeed, much of the film appears most concerned with how one deals with an aging relative, rather than exploring their enduring relationship. 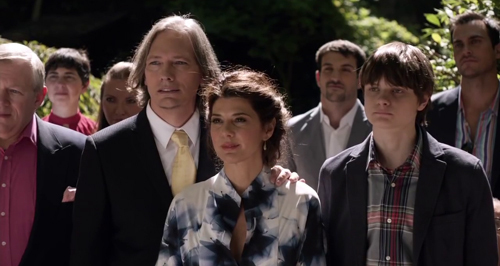 Ben stays with his nephew Elliot (Northern Exposure’s Darren Burrows; John Cullum also appears, so I can only assume Sachs was/is a fan of the show), wife Kate (Marisa Tomei) and son Joey (Charlie Tahan), leading to some “Isn’t he a silly old duffer?” scenarios (“I can’t really work if there’s someone else around” Ben divulges to the constantly interrupted Kate, who is trying to get on with her next novel). Meanwhile, George is really feeling the generational divide with his well-meaning ex-neighbours, a couple of cops who are constantly entertaining. George is a piano teacher, and the use of Chopin on the soundtrack lends the picture an agreeably twilight, melancholy quality. Both leads are expectedly very good, but the whole is so low key it could blow away in the breeze. You’re asking me why I killed Justin Bieber? These people live in parking lots! I think the exorcism made the problem worse. I need to believe we didn't treat him like trash. Never liked the fellow. Not sound on pigs. I’m in my head now, and it’s where I should be. Our friend told us to find Dracula. I thought it'd be great to get back to work.